Earlier this year we announced we would complete our goal this summer of 100 National Park units visited as a family by 2020 by visiting Volcano National Park in Hawaii in June. When we first set out with our goal 4 years ago we always felt it would be fitting to finish it off on the crater rim of Mt Kilauea. This announcement brought both immediate excitement and immediate stress! Here we were in February sitting at 89 National Park units visited with the need to get to at least 96 by the time we left for Hawaii on June 16th. We had already planned a trip to Chicago for Spring Break and visited the 1 National Park unit in Chicago, The Pullman National Monument. This brought us to 90. When looking at our packed calendar, between soccer, and rowing, and Mother’s Day, and Father’s Day, we had 2 open weekends before June 16. And so, this past weekend, we planned a quick sprint to scratch 2 more NP units off our list. We have cleared all the National Park units in North Carolina and South Carolina and with only a 2 day weekend it meant finding a few sites in Virginia. We woke up early Saturday morning, got on the road by 6:30 AM, and drove 4 hours north to the George Washington Birthplace National Monument. The George Washington Birthplace National Monument is quite the National park unit! I admit, I had low expectations coming into it. After all, we have already visited Mount Vernon so what is left to know about our first President? We quickly found out this site is so much more than the area where George Washington was born. This unit contains historic structures, a farm, great trails, a picnic area, a beachfront, an informative Visitor’s Center, and beautiful views of Popes Creek and the Potomac River. It was a day filled with intermittent drizzle and full on rain so our visit had its share of challenges. 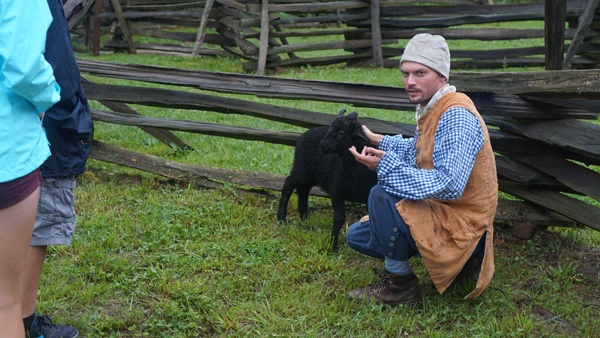 But it was also a planned “Special Event” day where Park volunteers and staff were in period costume and had demonstrations in blacksmithing, cheese making, soap making, music, and a tour of the farm. While some of the events like tobacco planting were canceled due to weather, we enjoyed basically having the place and the staff to ourselves! The National Park Rangers and staff continue to go above and beyond to create amazing experiences for visitors. We had a great Ranger named Bill give us a tour of the main home structure on the property. While this was not the original structure that George Washington was born in (that burned down in the late 1700s), it was filled will period items and set the stage for us on what it was like to live in that area at the time. We also had a fantastic tour from the guy in charge of the animals and crops on the farm. In the pouring rain, he gave us a 30-minute tour to meet the heritage breed animals on the farm and to learn about the tobacco and flax crops. We, unfortunately, did not get his name but he was the highlight of our visit. – The movie is a 14-minute video explaining the typical day on the farm. It needs updating and we wished it had more about George Washington’s early life at the site. – Most of the trails were washed out by the rain but in dryer times it would make for a great stroll along the water. – This unit is located in a pretty remote area of Virginia with very few options for food. We packed a lunch and ate at a covered pavilion in the picnic area. There are bathrooms and grills there. 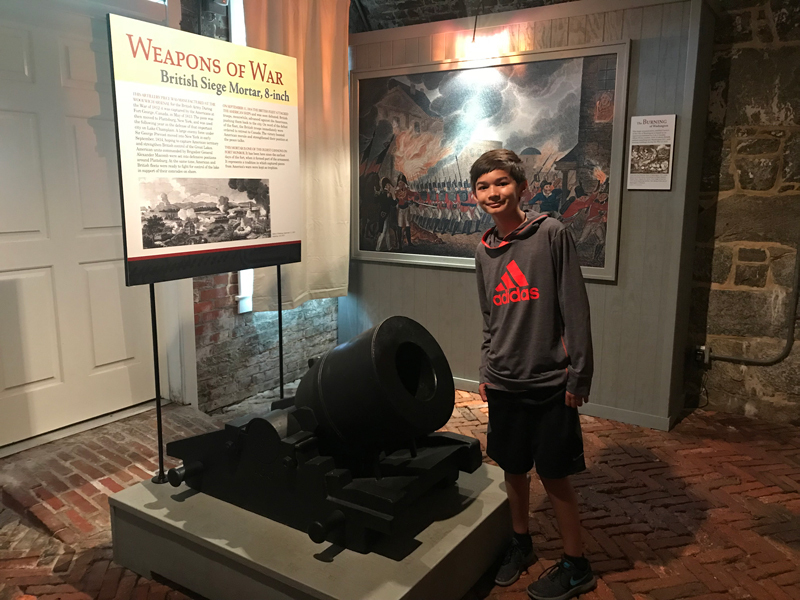 There is no official National Park Visitor Center yet, but there is a well-established Casemate Museum on-site and has all the history, artifacts, and context to the area for visitors. It’s also free and self-guided which is a huge plus! 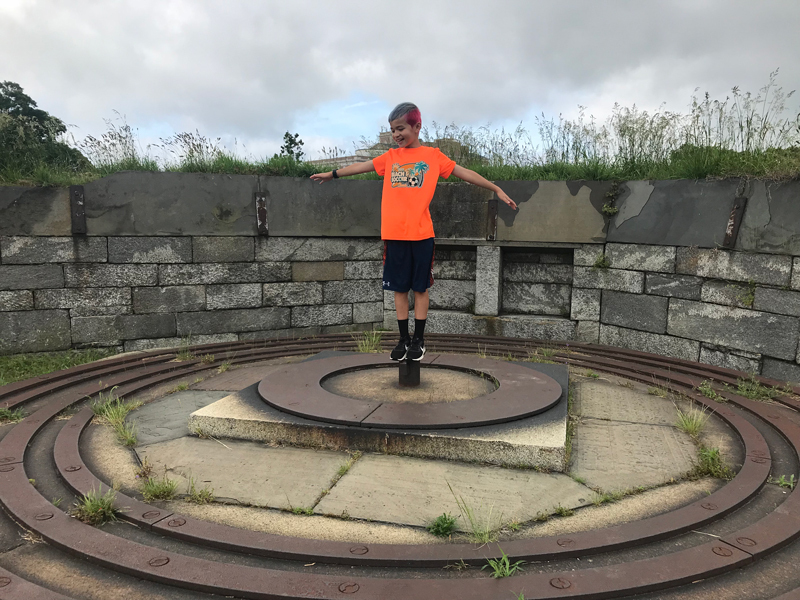 We had a tight itinerary that forced us to leave by noon on Sunday to drive home and the Casemate Museum was not open until 10:30 AM so we arrived early at 9:00 AM to walk the grounds. 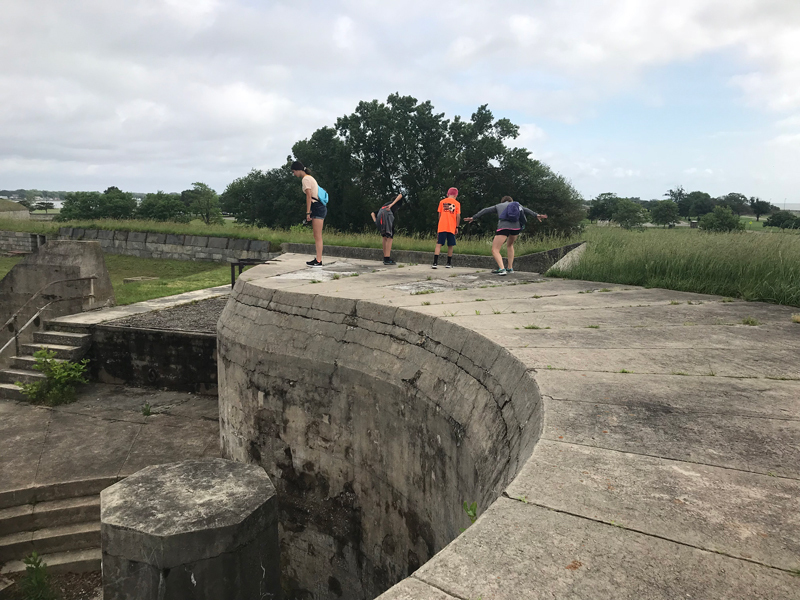 It was a fantastic experience to drive through the narrow gates inside the fort walls and to then walk around the perimeter of the fort walls taking in the scenery around the fort as well as the remnants of cannon mounts. The early morning weather was cool and breezy and it was great just taking our time taking it all in! Most of the top of the fort is wide enough and not treacherous. There is one area where it’s very important to make sure your kids don’t run ahead and out of site. My kids are old enough to know better but if you have toddlers, hold their hands at all times. If you are like my wife and I and just love taking pictures of historic structures and the details around ironwork, you will have a field day here! And the kids will like it too! Right when the Casemate Museum opened at 10:30 AM, we were there! The Casemate Museum has great artifacts from the time. 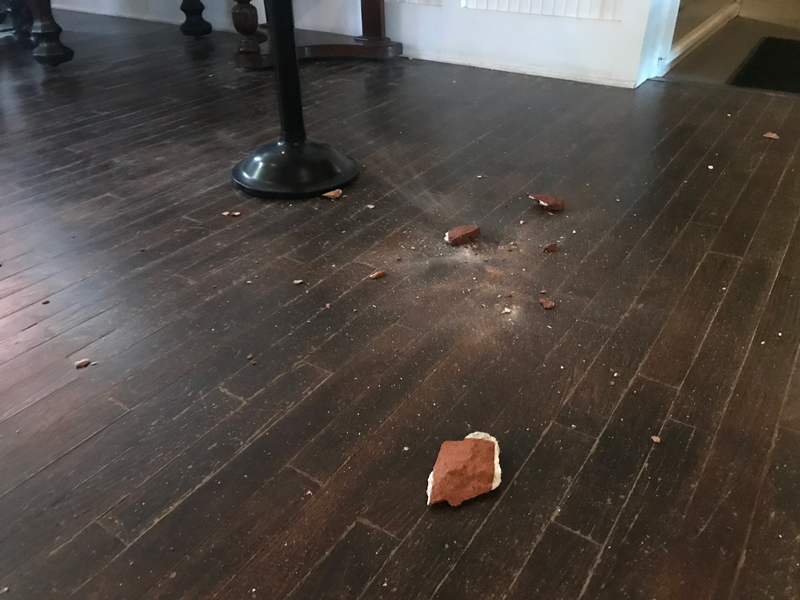 And it is so authentic, in fact, that pieces of brick are still coming down occasionally onto the museum floor. We stumbled upon freshly broken brick when we walked through the exhibits! 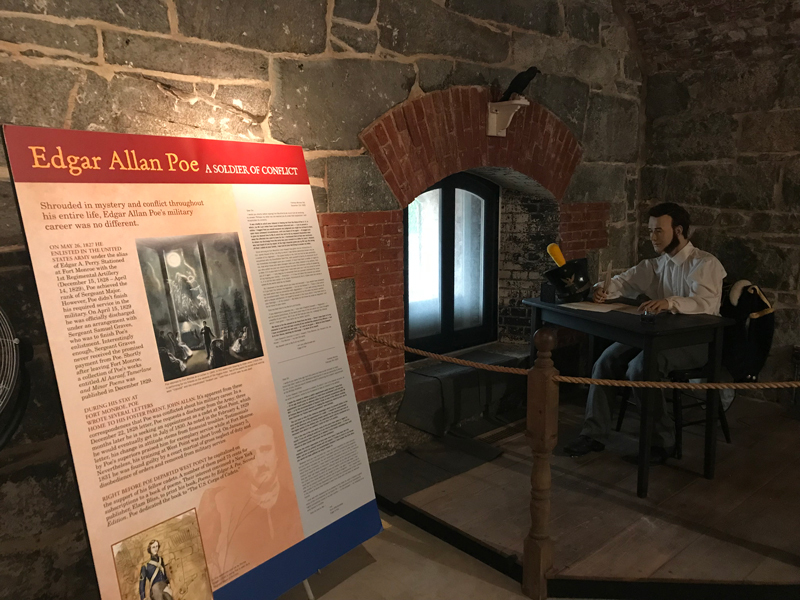 Many noteworthy people in American history lived, worked, were stationed here in Fort Monroe including Robert E Lee, Jefferson Davis, and Edgar Allan Poe! 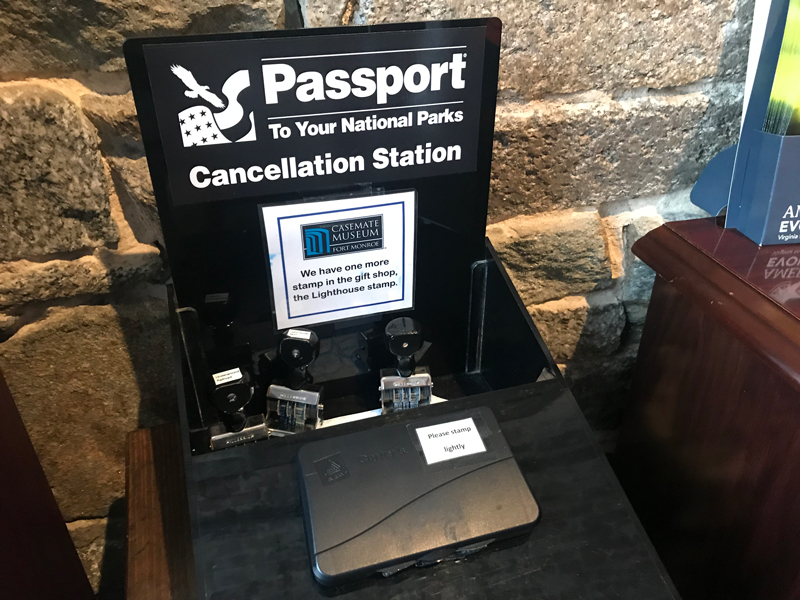 And even though there is no official Visitor Center, the Casemate Museum has Passport Stamps! – The Casemate Museum has bathrooms inside around the halfway mark of the exhibits. 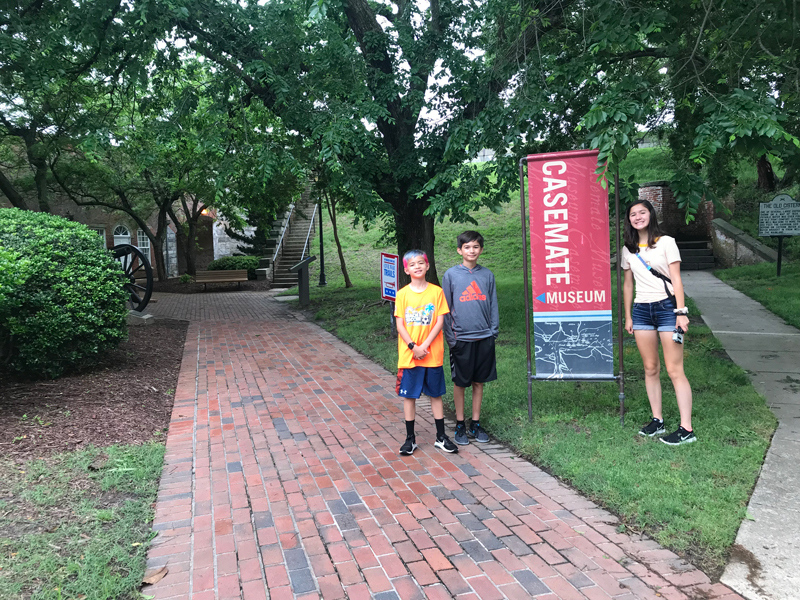 – The Casemate Museum is self-guided and FREE. They do offer guided tours throughout the day. – If you walk the perimeter of the fort you will see many tombstones. The top of the fort is a pet cemetery of the animals that died from military families stationed at the fort. Two more down, 8 to go! 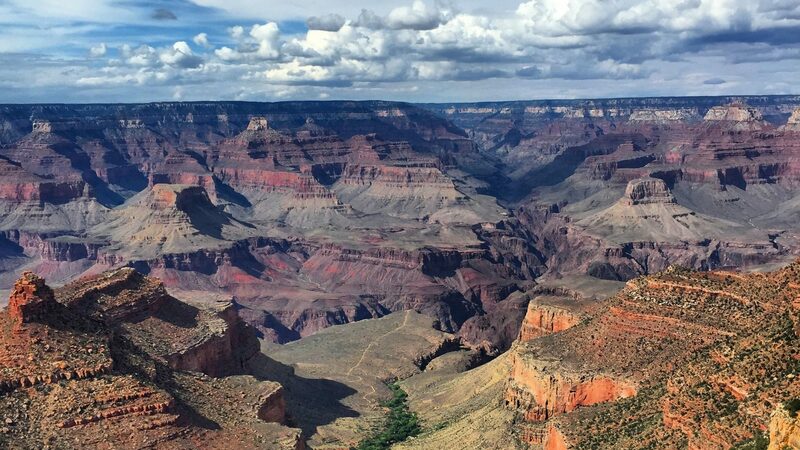 We were able to visit these two National park units in 2 days and while it was a whirlwind weekend, we need to recharge our batteries and start prepping for our next National park adventure….next weekend! On Memorial Day Weekend we are visiting another 5 National Park units. Click here to see our running list of National park units that we have visited and those that we have planned! Thanks for following us on our adventures!